Upon my first reading of The Importance of Being Earnest, its perfection was pretty evident to me. For me, the play meets every requirement that I look for in a comedic piece: brilliant timing, lovely (but not cliché) wordplay, sarcasm, planned plot points with no frayed ends. Now I am a huge fan of Mr. Bill Shakespeare and fellows like Tennessee Williams and Eugene O’Neil (and I often feel that few come close to such perfection), but who can argue with Oscar Wilde? The man has given us Bunbury and we are forever grateful. The play is perfectly written, leaving no stone unturned, no loose ends, and keeping the audience entertained all the while; therefore, when I get a chance to see its perfection live, aloud, and in the theatre, I jump at the chance. 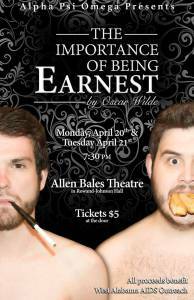 University of Alabama’s Alpha Psi Omega recently presented The Importance of Being Earnest, and quite earnestly, might I add. Directed by Samuel Hardy and co-directed by Anthony Haselbauer, the show had every audience member laughing at the well-directed comedic timing and twitching about in their seat with joy at the sheer ridiculousness of watching men in period costumes stuffing their mouths with muffins and cucumber sandwiches. Wilde gave Hardy a brilliant script to work with, and Hardy delivered a quaint, amusing package that has left me craving muffins and wishing to write all about it in my diary. Jordan DeWitt’s goofy humor left me in stitches. His boisterous attitude partnered with the appearance of a stiff upbringing gave us a beautifully well-rounded and altogether amusing Algernon. Algy, who is more glutton than charm, is always a crowd favorite because— well, who doesn’t love a charming pig moved in the manner of love? And Jack Worthing, or Ernest as we know him for a good bit, was played by Jacob Valleroy. Valleroy gave us a lovely depiction of the charming, if not bullheaded, man who is the axis the plot revolves around: Jack and his (not so earnest) Ernest. The chemistry between our DeWitt and Valleroy was something like bromantic bantering, and I was greatly amused at the ease with which the “frenemy” vibe flowed. The ladies didn’t give the boys a chance to steal the audience’s attention though. Shea Smitherman’s ease onstage as Gwendolyn was refreshing. To viewers, it seemed that her character’s wordy way of speech was natural habit for Smitherman and the “stuffy” British humor did not twist her tongue in the slightest. She gave Gwendolyn a relatability that was seen by all. Molly Penny as “dear, sweet Cecily” gave us wonderful innocence and a tad bit of “is she as innocent as she wants everyone to believe?” The catfight between Smitherman and Penny was perfectly period in that they kept their lady-like composure and politely ribbed each other with pointed remarks, and yet the exchange was entirely relatable to every audience member who has ever known a female in their lifetime. Silvia Craig played the nose-in-text, tortured Ms. Prism and the alluring Andrew Brown played her delightful Dr. Chasuble. We, of course, had our delightful manservant Lane, played by Bo Gorham, and our butler Merriman, played by Mike Jones. But who was possibly the most talked about of the evening? I can assure you that Lady Bracknell is quite accustomed to being the topic of good conversation, but Lady Bracknell as played by Tommy Walker? There was not a straight face in the house. He delivered shrill and piercing shrieks, hilariously melodramatic gasps (complete with chest clutching), and kept the audience believing him with his deliberate poise. If you can’t get Maggie Smith or Edith Evans as your Aunt Augusta, I’d suggest a fellow quite similar to the boisterous Walker. If one asked me to pinpoint my favorite moment of the show, I’d have a hard time choosing between the beautifully staged muffin argument and the closing comment. Jack states “I’ve now realized for the first time in my life the vital importance of being earnest,” but it was not an ambiguous pun one often sees in productions of Earnest but rather a clear comedic moment furthered by the other actors’ amused reactions. Hats off to you, directors. We enjoyed every second. This review was originally published on PlainKateReviews. “City of the big shoulders . . .
Vanishing Sights is licensed under a Creative Commons Attribution-NonCommercial-NoDerivs 3.0 Unported License.